Pakistan didn't go into the fourth day thinking of a win but, after their bowlers picked up late wickets, the contest remains open to the possibility of a twist on the final day of an otherwise slow Test. After losing the toss, Pakistan had seemingly accepted that forcing the win they need to draw the series was a distant possibility but their coach, Dav Whatmore, has not given up on getting a result. Trailing 1-0 in the series and having played conservatively throughout the match, Pakistan find themselves 220 behind and needing five more second-innings wickets to set up a run chase. Sri Lanka, having done as much as possible to slow the game down in pursuit of a draw, crawled to 133 for 5 in 71 overs, as Mohammad Talha provided a spark for the hosts. "The game is nicely poised going in to the last day," Whatmore said. "It will be a very interesting fifth day. We just need five more wickets quickly so I think it will be a very important first hour and we take it from there as it goes along. "We really expect to continue to create chances. You can't win a Test match in a session so you need to continue to chip away at them and when the chances come, take them. It is still pretty much a flat wicket, except for the footmarks. Other than that, it just hasn't broken up. If it pitches in an area where the footmarks are it has become a little bit tricky, but other than that it is just a very flat wicket which is playing a bit slower now." 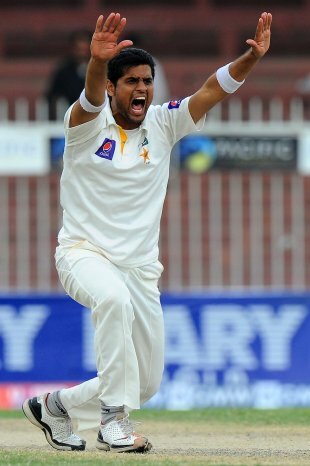 Pakistan lost their way in the first session, their remaining four wickets falling inside 15 overs to trail by 87 runs. Misbah-ul-Haq tried to whittle down the deficit in his familiar, steady fashion but there were questions as to whether Pakistan could have pushed harder for quick runs earlier in the game, to put pressure on Sri Lanka. When asked, however, Whatmore was clear about his team's desire for victory. "Every game we play we try to win, so we will go all out to get the best we can to achieve the result," he said. Saeed Ajmal's struggles continued, although he found the right length to bowl in the evening session, picking up the wicket of Mahela Jayawardene. Ajmal has so far taken eight wickets at 50.50 in the series but Whatmore defended his star bowler. "If you have seen the first two Test matches you will know the wickets have not favoured the spin bowlers," Whatmore said. "Ajmal is still a world-class performer. All world-class performers need a little bit of encouragement from the wicket and we haven't had that."